​Net of Compassion is a faith based collaborative effort of many volunteer groups bringing vital support services to people in need. 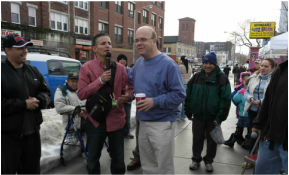 Net of Compassion is a collaborative effort of many community groups founded and driven by a highly committed citizen of Worcester, Massachusetts. After overcoming his long battle with homelessness and addiction, Director Richard Gonzalez now reaches out to the homeless, addicted, and under served in our community. Together with his wife Elizabeth and a dedicated group of volunteers, Net of Compassion tirelessly works on the streets of Worcester to seek out citizens with the most need. Since it’s inception in 2010, Net of Compassion has been providing an opportunity for many volunteer groups and people of faith to come together to save the lives of the city's most vulnerable population. This community organization is overseen and driven by Richie Gonzalez, a highly committed man of God, who overcame his own lifelong battle with substance abuse. Directors Richie and Elizabeth Gonzalez and their team of volunteers run an extensive outreach effort in Worcester, Massachusetts for men and women struggling with active addiction, prostitution, homelessness and those living with mental illness symptoms. The volunteers of Net of Compassion help by forming a safety net of support for these folks, providing peer support, food, clothing, recovery counseling and many other services. Mr. Gonzalez and his wife Elizabeth are also ordained ministers, offering spiritual guidance and times of prayer during Net of Compassion outreach activities. 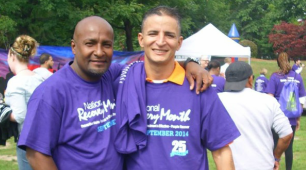 Through relationships with Richie and his team, many now have the opportunity to restore their faith and get reconnected to a healthy and productive life. Director Richie Gonzalez started this outreach effort over in 2010 with just a card table and some bagged lunches. He returned to the very spot where he used to struggle himself with addiction. He knew that now that he had found his faith and sobriety that had to share it with his community. Now along with countless volunteers, he is cooking and serving a hot meal to an average of 250 people per week. Richie and Elizabeth Gonzalez are incredible people of faith and all of their program needs have always been met through private donations. They do have plans for the future which include a permanent office space and they would eventually like to open a housing program. Join the Net, connect with us today. Richie has been featured in many publications, visit here to read the Worcester Spy Interview. The Worcester Telegram an Gazette also featured Richie recently, click here. 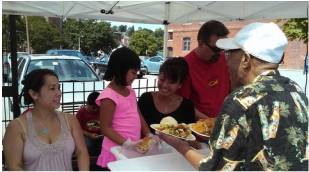 ​Each week volunteers cook and serve a homemade meal right on Main St Worcester to over 250 people living in addiction, homelessness and poverty. Volunteers also distribute food bank groceries, clothing and encouragement. Many of us are in recovery. We know the challenges of addiction and have a better understanding of the help that is needed. We provide peer to peer counseling, and referrals to shelters and detoxification programs. Net of Compassion helps clients to find hope again. ​Net of Compassion is creating a community of support for clients and an outlet for volunteerism for the community. Every week we depend on many volunteers to help to run the food and clothing program. Together we try to bring light into some of our friends darkest times. Net of Compassion relies 100% on private donations and small grants. ​Please consider partnering with us. Donate today.